When someone mentions a drive-in theatre, I immediately think hot rods, ponytails with ribbons, fountain drinks, and doo-wop music. While a visit to the Silver Moon Drive-In located in Lakeland has the nostalgic feel of all those things, there are the amenities of modern day America too. And to top it off, it is affordable! 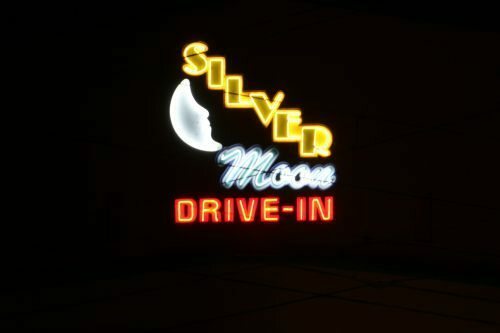 Silver Moon sits on New Tampa Highway/US-92 and adorns its entrance with neon signs making it impossible to miss. It’s been in operation since the late 40’s and is one of the few drive-in theaters still operating in Florida. They offer showings of four newly released movies every night. Be sure to call or visit their website for movie listings and times. As you pull into the entrance lanes, you are greeted with friendly service and asked to pay your admission (which is only $5 per adult and $1 for children ages 4-9 for one movie). You’ll then be directed to the appropriate screen and told which FM channel to tune into for your movie sound. In-car speakers are also available for those who want a true drive-in experience. Be sure to arrive at least 45 minutes early as spots fill quickly. Those with larger vehicles are asked to park towards the back for the courtesy of those patrons in smaller vehicles. After settling into our perfectly picked location, we walked to the concession stand for some drinks and a bite to nibble. We loved how the vintage decor added to the classic feel of the drive-in. They have all of the food and drink choices of present-day theatres along with a small selection of beer. We ordered two drinks and a medium popcorn for a total of $6.50; a modest price to pay for snacks these days. Keep in mind, you do have the option of bringing your own snacks to make the date even more economical. Looking for a heartier fare to go with your movie? Make dinner or grab it on the way to enjoy with your flick! Writer Erica Thomas loads up on movie snacks. We decided to explore the grounds, since we had time before the movie started, and found a pet walking area for your four-legged friends who may be joining in on date night fun. A little before the previews and feature presentation began, time-honored commercials for the concession stand and guidelines for the movie were shown while 50’s classics played through the speakers. We opted to relax in the cool of our vehicle’s air conditioning for our movie experience while others reclined with their windows down or lounged in lawn chairs under the stars. As the movie began, I found myself thinking how enjoyable this cinematic encounter was becoming. It was as if we had our own private theatre I could lounge in. Whether you prefer the indoor climate or outdoor atmosphere, Silver Moon brings them both together in this long-established activity. It is an entertaining date experience for making memorable moments any time of the year. By the way, if you and your companion are early birds or enjoy the search for great finds, every Saturday and Sunday morning at 5 am, the grounds are converted into the Swap Shop. This quaint market is ever-changing and offers anything from antiques to clothes to produce. The snack bar offers delectable breakfast sandwiches and chilling drinks for shoppers to delight in.